Arthur Shilstone (American, b. 1922) View of Mesa Verde, Colorado. View of Mesa Verde, Colorado. 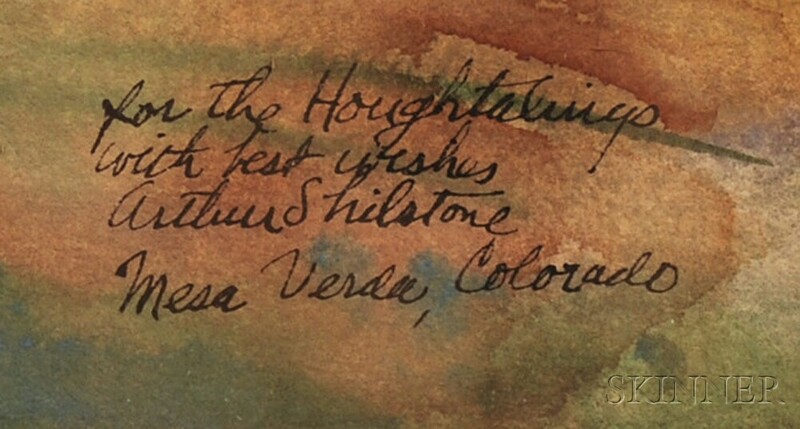 Dedicated, signed, and inscribed "for the Houghtalings/with best wishes/Arthur Shilstone/Mesa Verde, Colorado" in pen l.r. Watercolor and graphite on paper, sight size 14 x 18 3/4 in., framed (under glass). Condition: Not examined out of frame.